Saltiness is a taste that can be very desirable in foods. When combined with fat, salt can override the normal ability of fat to promote a feeling of fullness, leading to passive overconsumption. 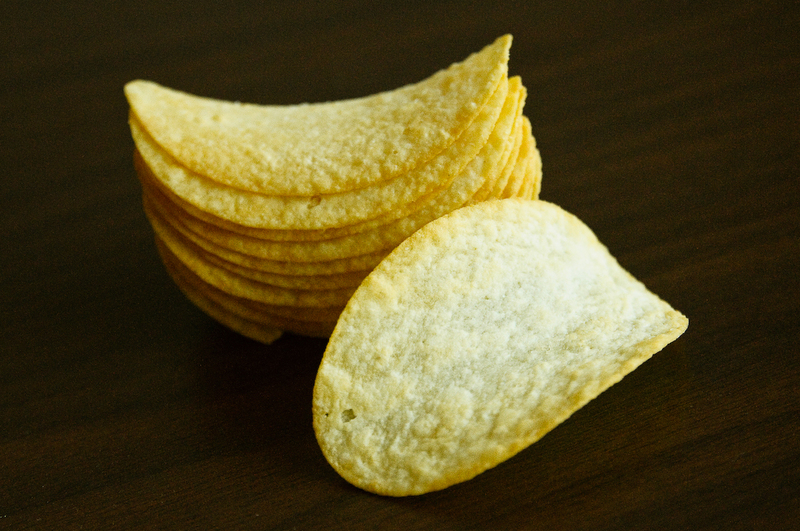 This could explain why salty, high-fat snack foods are so moreish. Weight gain is a complex issue. But there is little doubt that the current food environment in Western countries – heavy in highly processed salty, sugary, and fatty food – has a big role to play. Most of the salt eaten in our diet has been added to food in the manufacturing process. This is in contrast to the small amount of salt naturally present in most foods or what is added at the table or at home in cooking. Salt can be a desirable taste, increasing the palatability of foods in addition to helping preserve it; that’s why it is commonly added in processed foods. Combining salt and fat together is thought to be a potent combination in helping to promote passive over-consumption foods. Just think of how moreish salty chips can be. Having a greater liking for salty and fatty foods is associated with eating more kilojoules overall, uncontrolled eating, and overweight in children. This link between overconsumption of food and its degree of saltiness is considered stronger than having a liking for sweet and fatty foods. Teasing out further how salt may influence the over-consumption of fatty foods, sensory researchers from Deakin University recruited 48 healthy adults to take part in a tasting panel. Over four lunchtime sessions (following on from a standardised breakfast that morning), each person ate a meal of macaroni and cheese where the fat and salt content had been manipulated. The four meal combinations were low-fat/low-salt, low-fat/high-salt, high-fat/low-salt and high-fat/high-salt. Participants were encouraged to eat as much as they wished until feeling full. Eating rate, meal agreeability, and subjective ratings of hunger and fullness were also taken. Eleven percent more kilojoules were consumed when the meals eaten were high in salt. And this was irrespective of if the fat content was high or low. The fat content of the meal didn’t result in people eating more food by weight, but because of its greater energy density, that meant more kilojoules were eaten. People who were considered to be sensitive to the taste of fat ate less of the high-fat meal, but only if it was also low in salt. Ratings of hunger before, and fullness after, each meal were similar and unaffected by the meal composition. This small-scale laboratory study points in the direction of the saltiness of food being able to influence passive over-consumption for foods high fat. In a time when there are too many discretionary food choices available that meet the criteria for being high in fat and salt, then this research helps explain why such food could be an important driver of excess eating and subsequent weight gain. Whether adding salt at home to foods low in fat like vegetables would give a similar, but much more favourable result of passive consumption would be an interesting research question to explore. Hey, I just stumbled upon your article about broccoli and found your site there I read the article about salt. I liked both articles and the scientific approach to nutrition. You’re of course professor in nutrition. I shared your article about salt on my Facebook site and translated the text for my few readers. I have also searched for if there is a difference in quality between salts of different origins, like seasalt,rocksalt etc. I’m particularly interested in Himalayan salt, the material and opinions on internet are very divergent even from professional sources. What is the case, is it better, worse than seasalt, could it really contain 84 minerals (haha) radioaktive polonium, uran,radium etc or cadmium, arsenic, lead a s o? Or just a few – appr 10 elements – as an old germain research said? What is the truth about Himalayan salt? I can’t find a good reliable article/opinion. Sorry to bother you with this, though I would be grateful for a reference source. Below asking for website. I ‘ve just a personal Facebook with a blog site on it writing about natural, healthy food. Great article Tim, thanks for the full PDF link also. Another caveat could be salt’s potential to passively over-consume on liquids afterwards some of which not being simply water based, which could potentially add more unnecessary kilojoules to the daily energy intake no? Given fat’s capacity to delay gastric emptying do you know of any studies where fat itself is associated with a higher fluid intake also? The combination could be a pretty significant one if the effect of both salt and fat are synergistic here and lead to even further consumption of fluids. Anecdotally I know I often get very thirsty after having some potato chips and need to remind myself that water is the best thing to follow up with so as to be mindful of overall caloric intake. Thanks again. Hope all is well.